The Indo Board Original is where it all started in 1998. The Original Series features a 30" X 18” oval deck in 11 color choices and 6 bundled options. 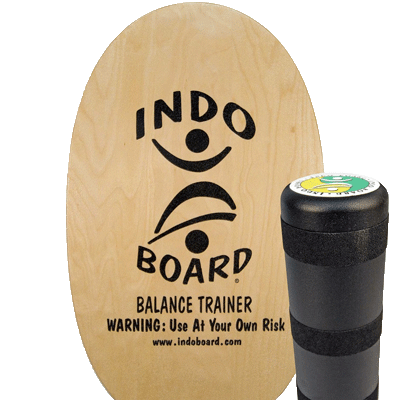 The Original INDO BALANCE BOARD Deck & Roller features our 30” X 18” oval Original deck that is coated with a non-slip surface and our 6.5” diameter plastic Original roller. This is the product that started it all. Since that time the iconic Indo Board Original has become a fun and functional training device that has been used by hundreds of world and national champion athletes, in virtually every sport, all across the globe. The Original is available in 11 different color graphic choices. Indo Boards are built with the finest quality materials available and are made specifically to withstand the rigors of daily use. With 20 years of research and development behind us we are confident that our products not only perform well but will stand the test of time. Good balance and coordination are key elements for enjoying everyday activities. Everything from just walking to serious sports participation, requires balanced coordination. Studies have proven that balance can be improved at any age with the proper training. A strong core is the foundation of balance and stability and can help prevent falls and injuries during sports or other activities. Balance Training creates a strong connection of the core and its ability to control the arms and legs when instability is encountered in any situation. This is essential to improve athletic performance in any level of sports activity as well as everyday well being.